The Rock & Roll Hall of Fame is alive with the passion and spirit of music that has reinvented itself time and again and touched generations of fans! Whether you’re Mr. Speed or want to Take It Easy, you can catch the excitement on a self-guided tour of our spotlights, stories & exhibits. The Power of Rock experience features ground breaking inductee performances in a seat-shaking theater! Get that front row feeling for highlights of 30+ years of induction ceremonies. This epic hall of fame pays homage to our inductees through an immersive concert-quality production and a space for fans to share their own stories. Love is all you need to prove the everlasting power of the music, as celebrated in our special exhibit Summer of Love Turns 50. Another milestone being celebrated through the end of 2017 is 50 years since the start of Rolling Stone Magazine, the counterculture start up that rose to the top by covering the cross-section of music, politics and pop culture. • Cities and Sounds: Motown, Psychedelic, Punk, Grunge... The unmistakable styles that put cities across the country and across the pond on the musical map. Our new “All Access Café” features delicious menu items from chefs Fabio Salerno, Jonathon Sawyer and Rocco Whalen. For all those day-trippers out there, we welcome hogs and low-riders right in front of our iconic building with a dedicated motorcycle parking area. Want to see what’s next up on our set list? 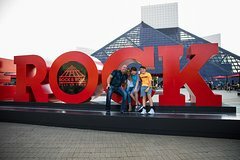 Check rockhall.com/onstage for a complete schedule of daily events.